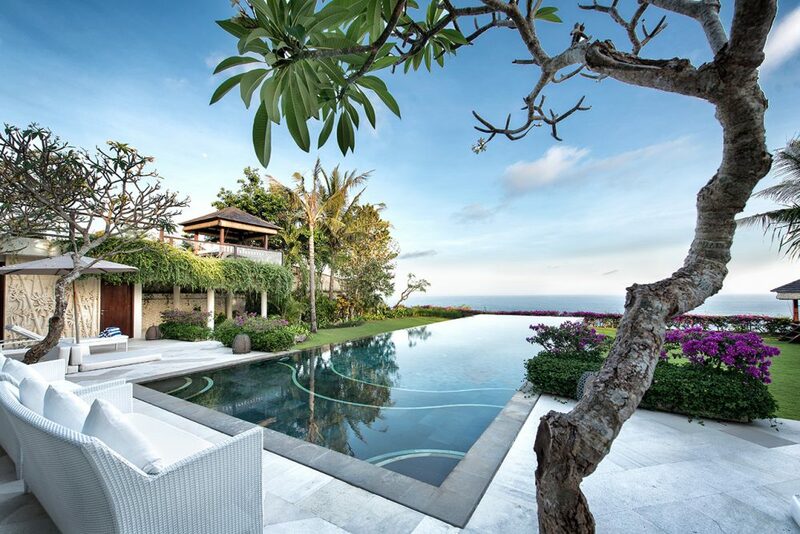 This spectacular clifftop villa looks out over the white horses of the Indian Ocean and the delicate coral gardens below. Millions of shades of blue and green, a perfect sea-breeze and the sound of breaking waves induce immediate relaxation. 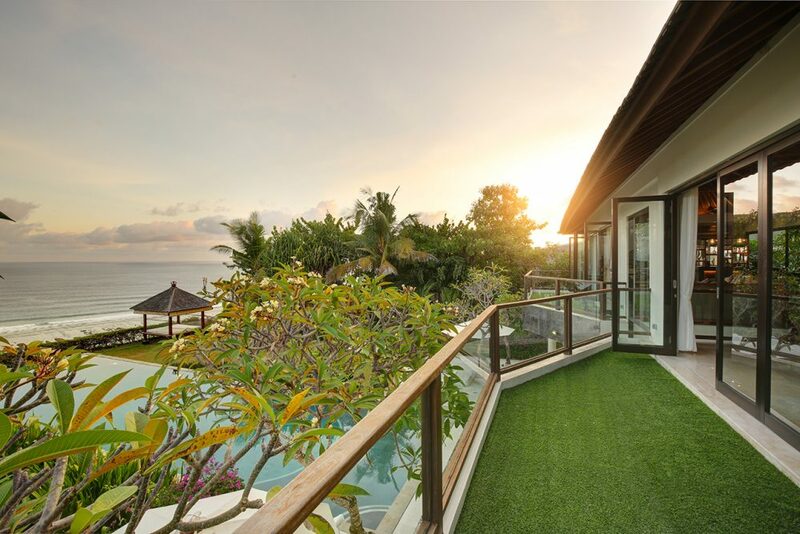 Kick back on the terrace to enjoy sundowners and a BBQ, afterwards jump in the Jacuzzi, relax in the air-conditioned living room or watch movies in the media room. 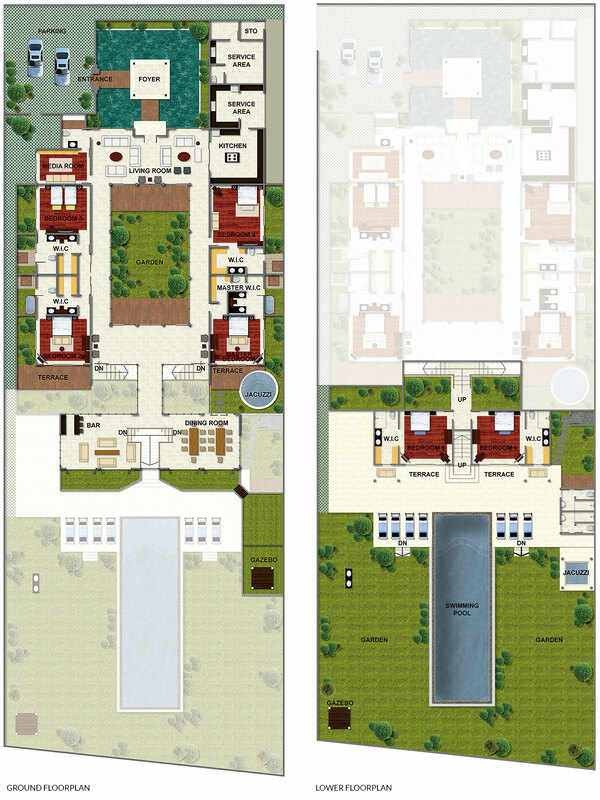 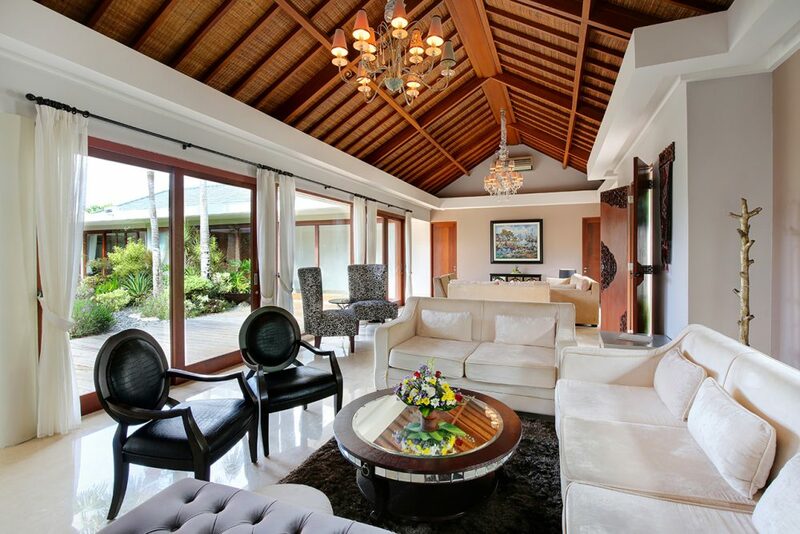 All the inside areas of this magnificent property can be closed off and air-conditioned, including the vast corridors. 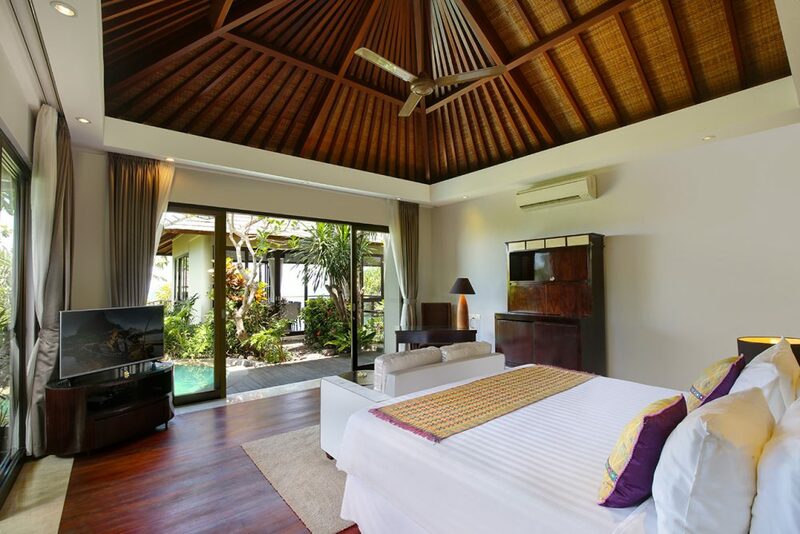 Gorgeous sea views dominate every communal space and most of the bedrooms too. 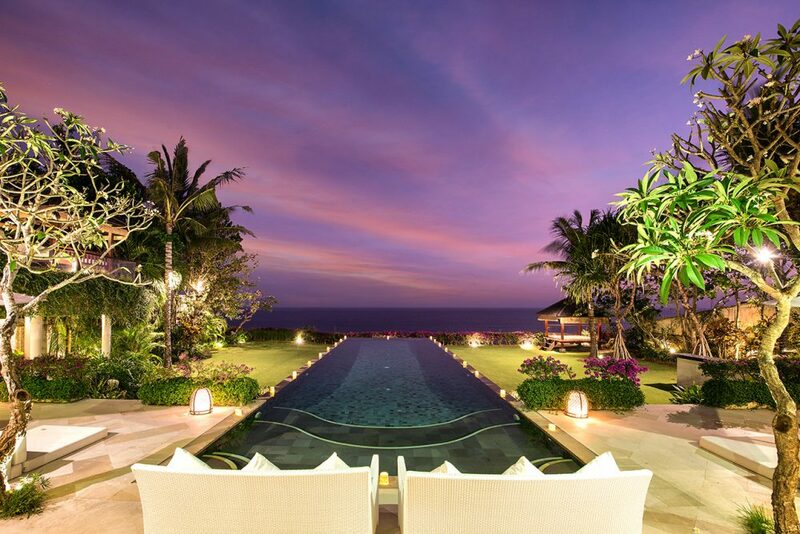 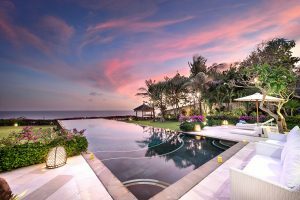 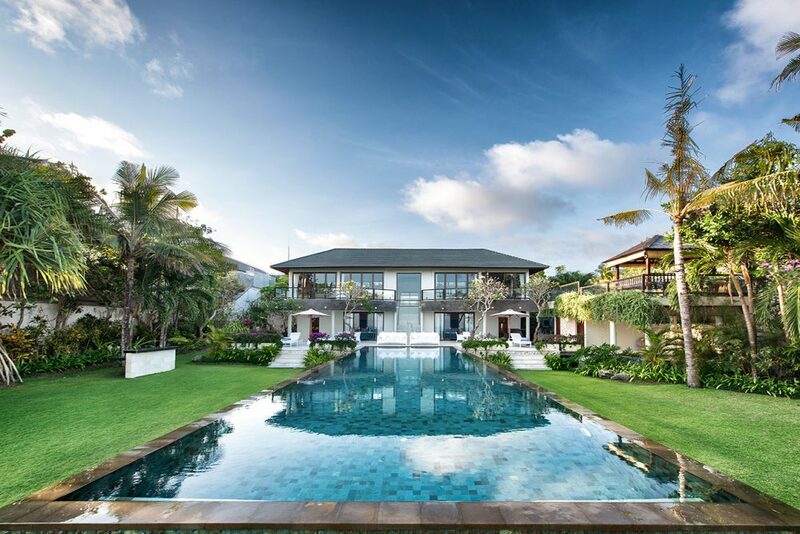 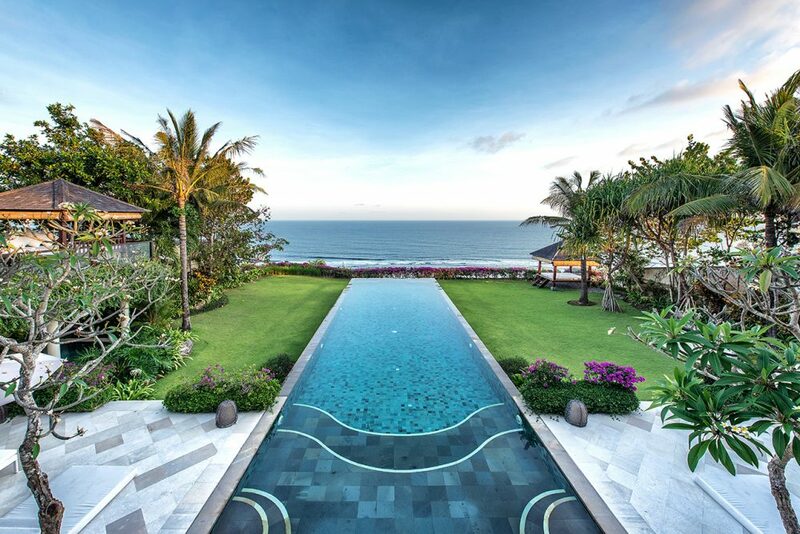 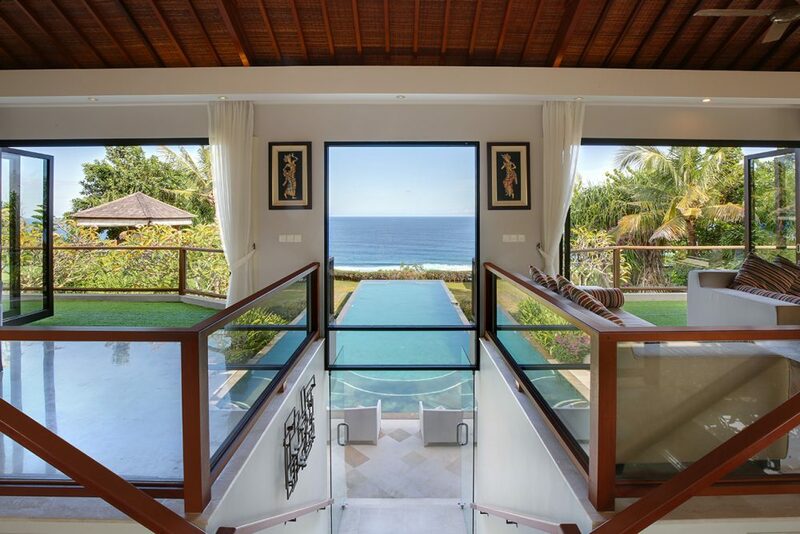 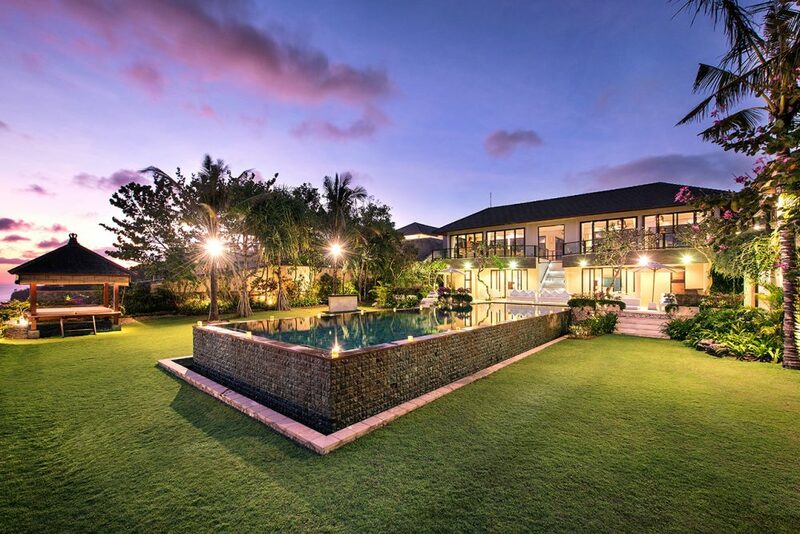 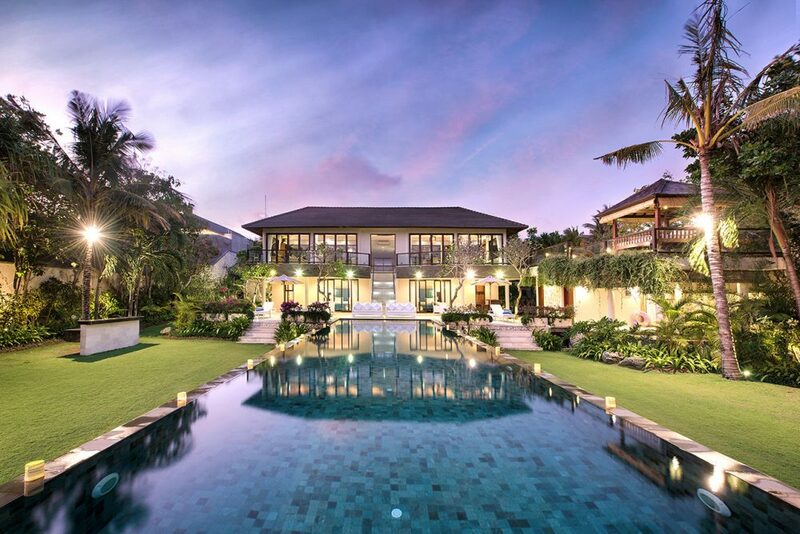 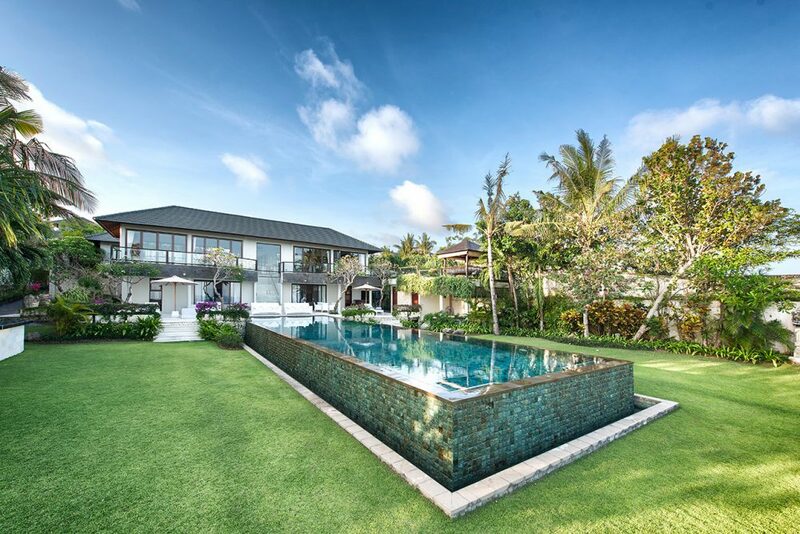 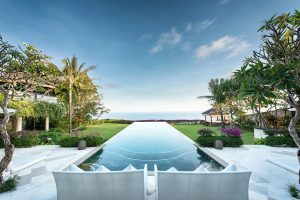 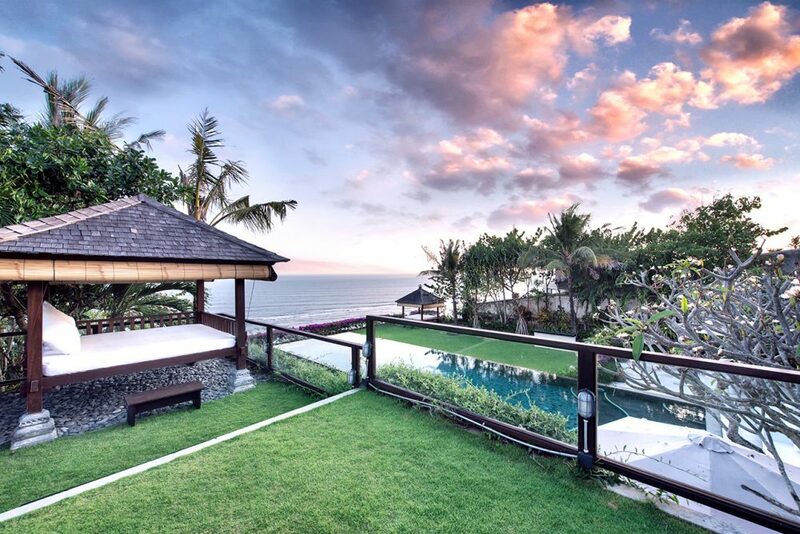 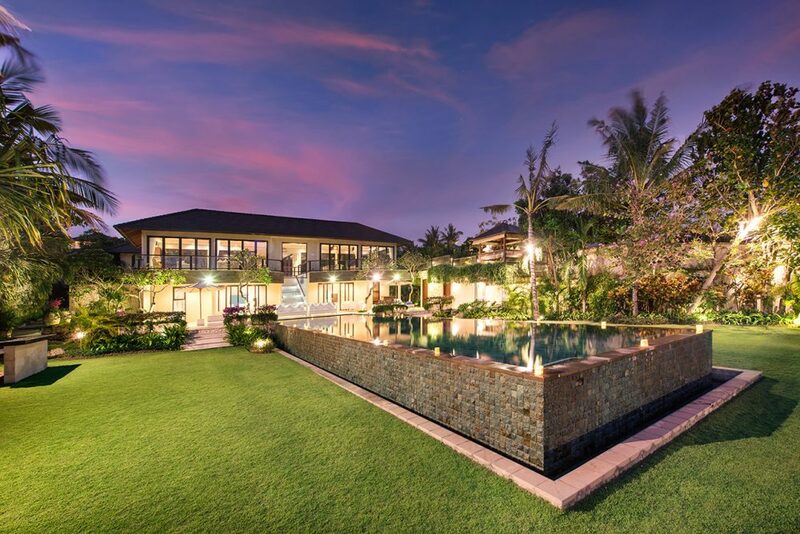 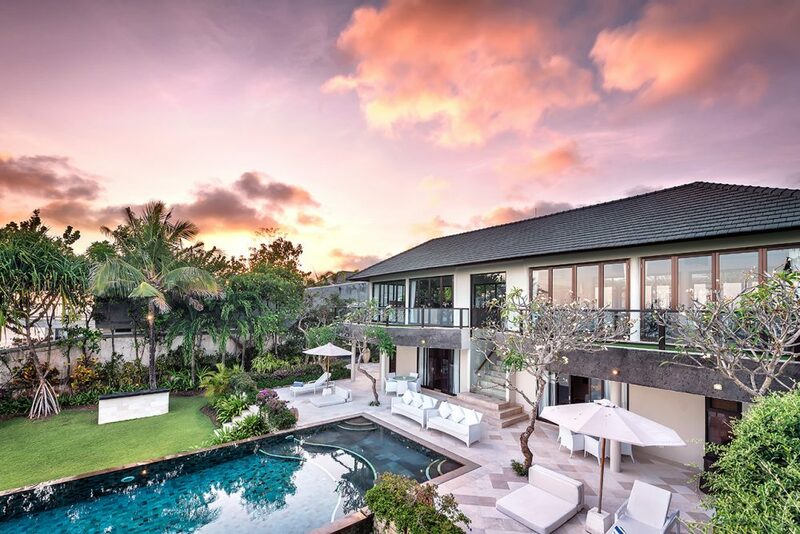 The jewel in this villa’s crown is the garden terrace which looks over the soaring panorama of the Indian Ocean. 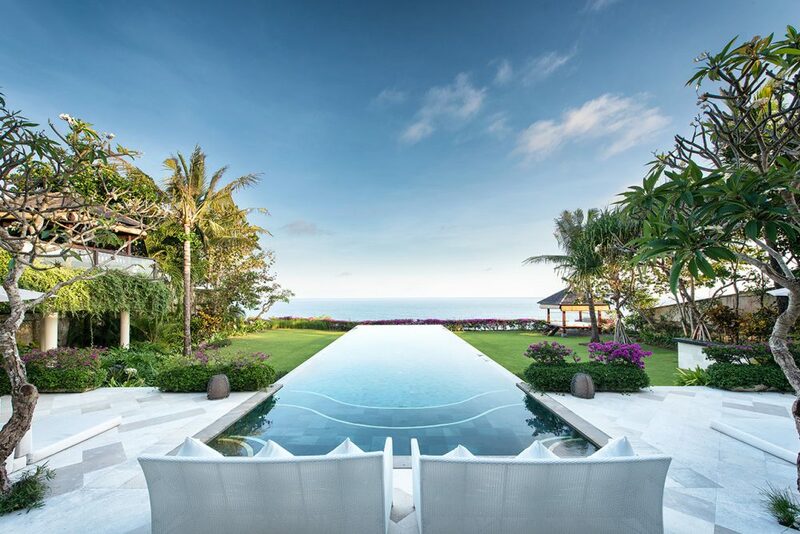 A 20-metre infinity pool surrounded by loungers sets the scene for many hours of fun and relaxation. Moreover, at the edge of the cliff, there is a gorgeous bale which catches the sea breeze perfectly, creating an ideal space for a late afternoon massage. Alternatively, hang out in the Jacuzzi relaxing in the frothy warmth chatting to your friends reclining on the covered double daybed nearby. 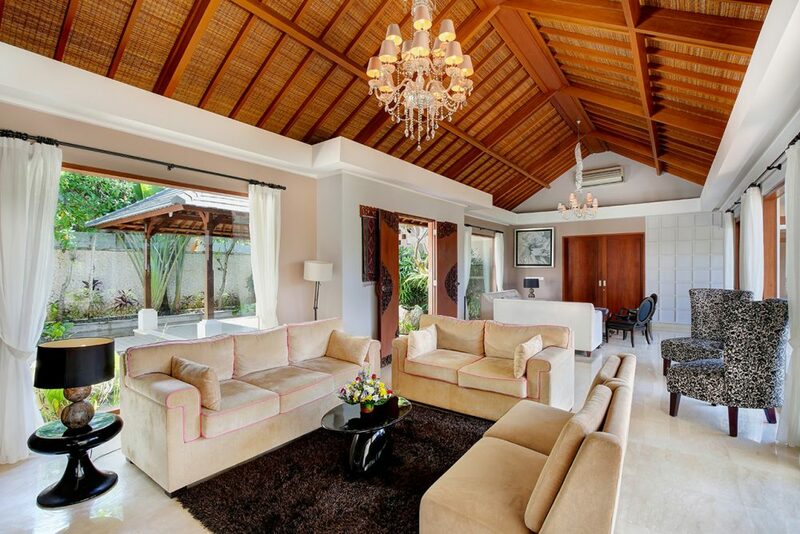 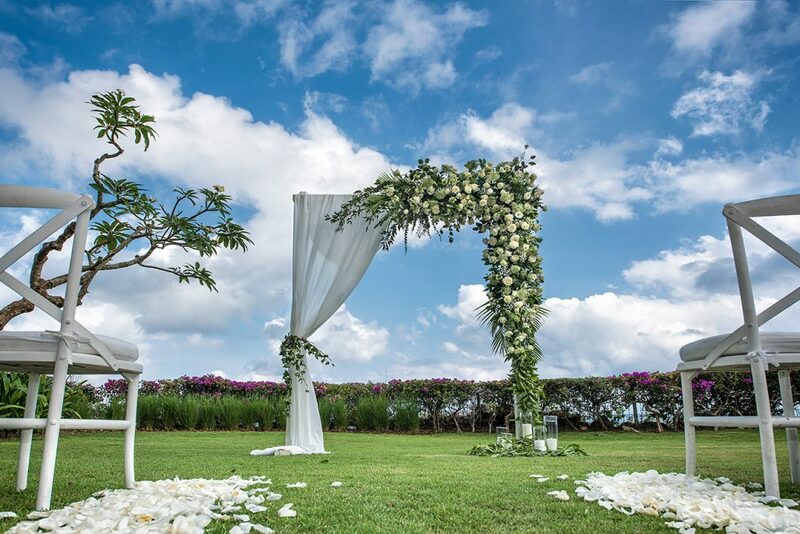 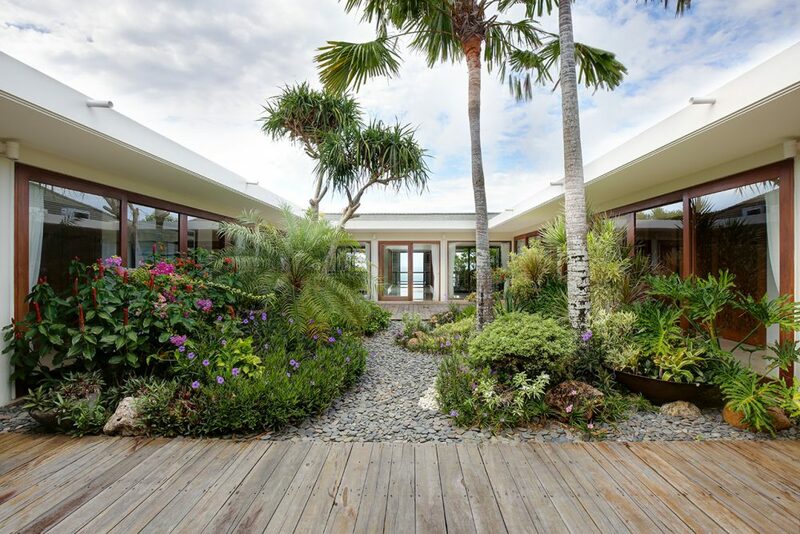 Inside, with wonderful views of the tropical clifftop garden, is a fully air-conditioned formal living and dining room. This is furnished with a fully functioning bar with an espresso machine and a wine cooler as well as a range of spirits. 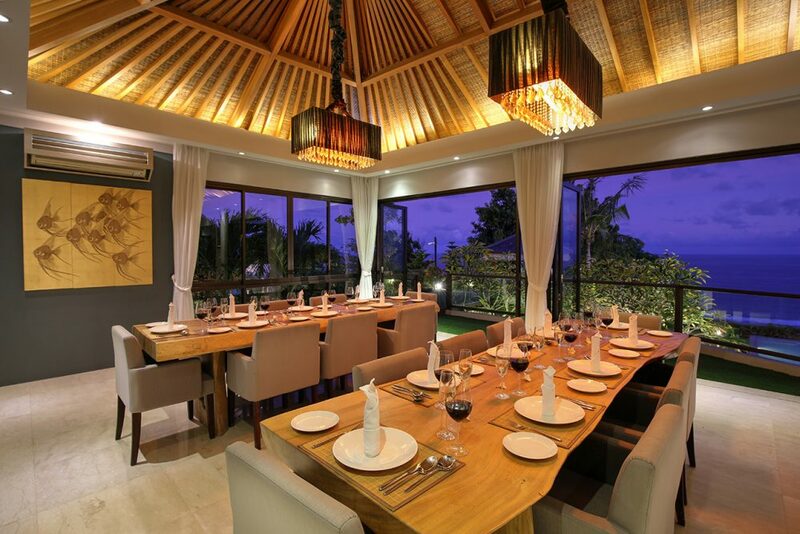 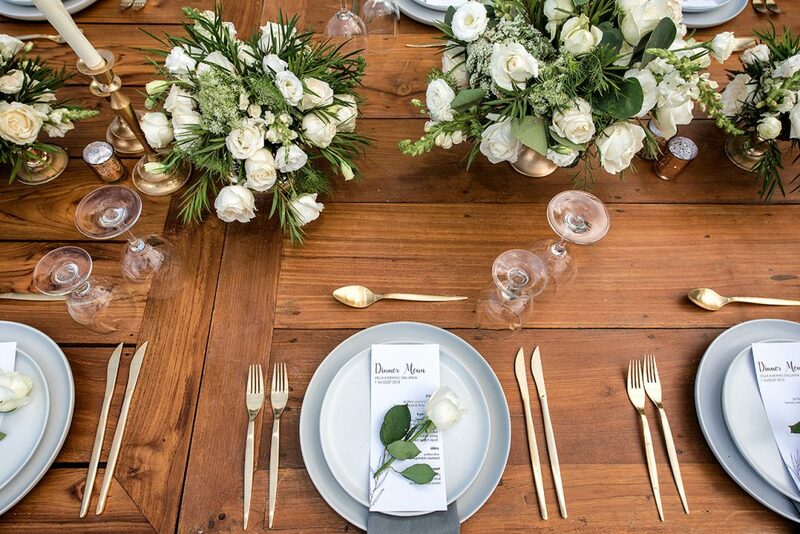 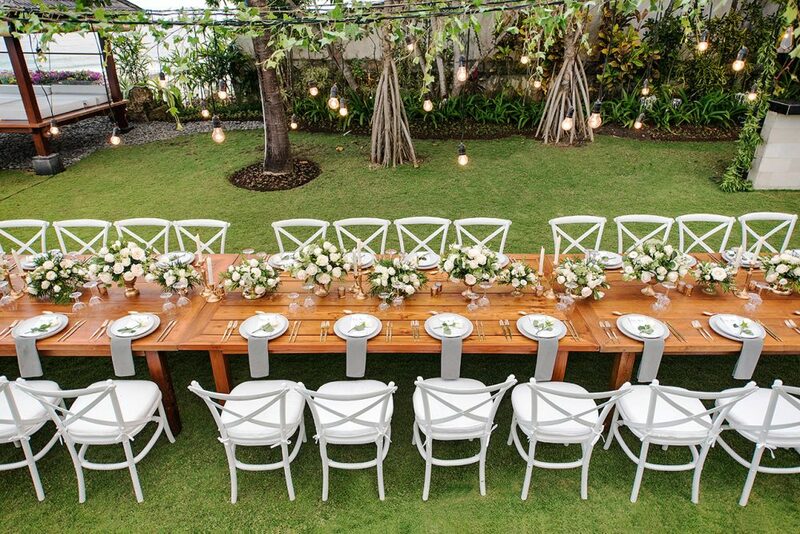 Oversized comfortable couches and a dining table with seating for 20 people complete this wonderful space. On arrival, after walking by pools filled with Koi, our lovely staff greet you at the formal entrance with pineapples filled with fresh juice while your luggage is taken to the relevant suite. 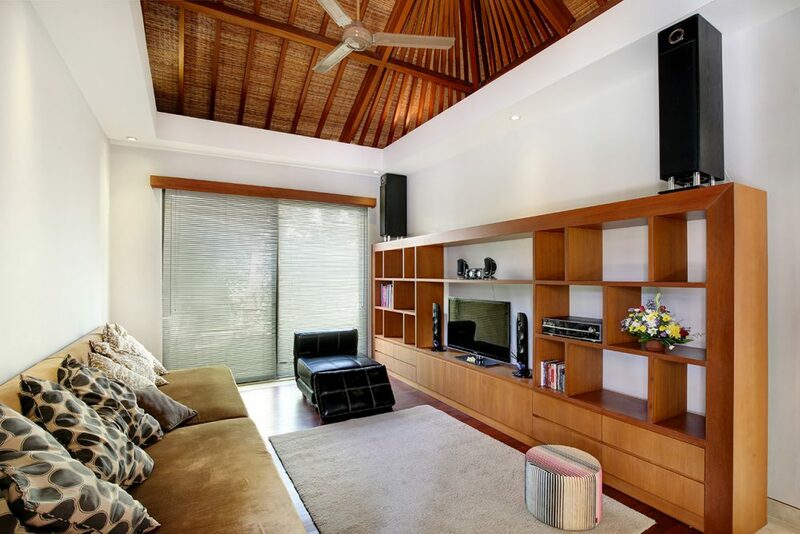 To one side of this elegant area is a modern fully fitted kitchen and to the other an air-conditioned media room for cosy nights in. 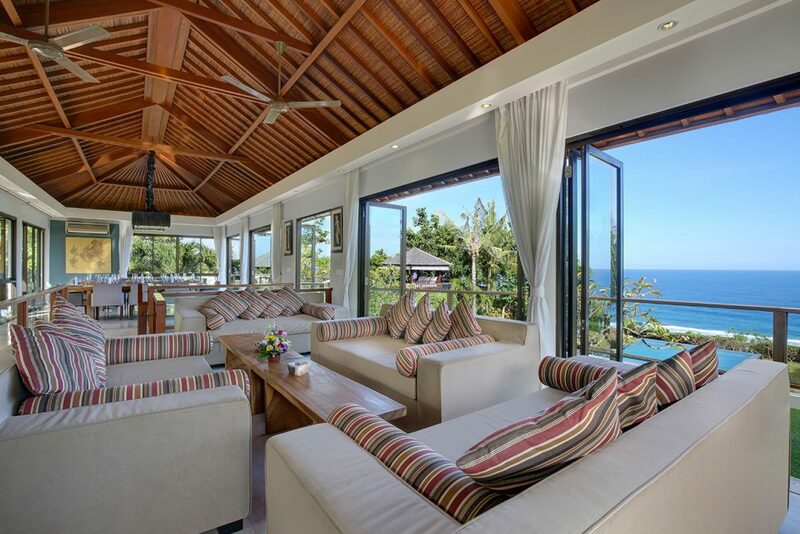 The accommodation throughout this villa is the height of luxury with beautiful textures and superb views. Every luxurious suite has both air-conditioning and a ceiling fan and is supplied with an LED TV, a phone and a safety deposit box. Four of the suites are situated on the entry floor and a further two are downstairs at the rear of the property with pool and ocean views. 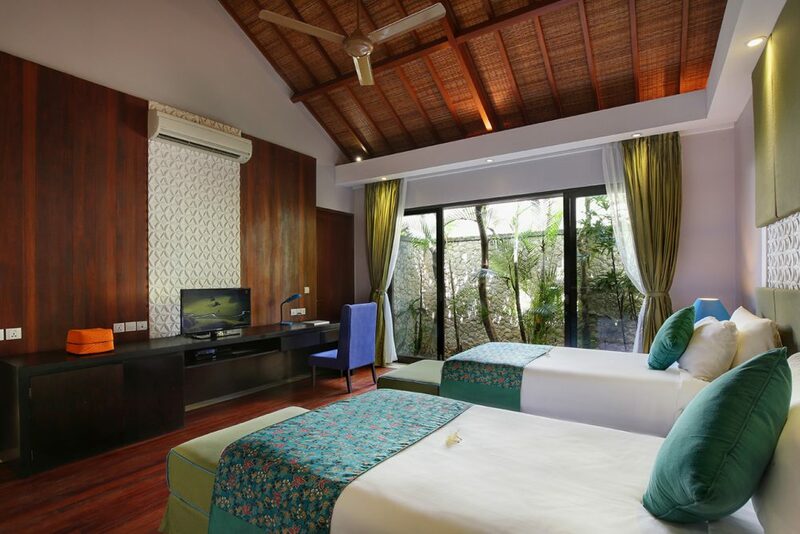 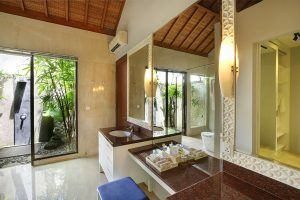 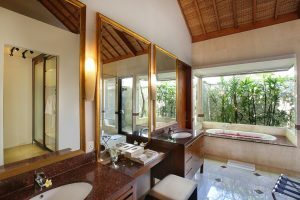 Villa Saujana has a spacious Master Suite has a stunning terrace cocooned by foliage with its own private Jacuzzi. 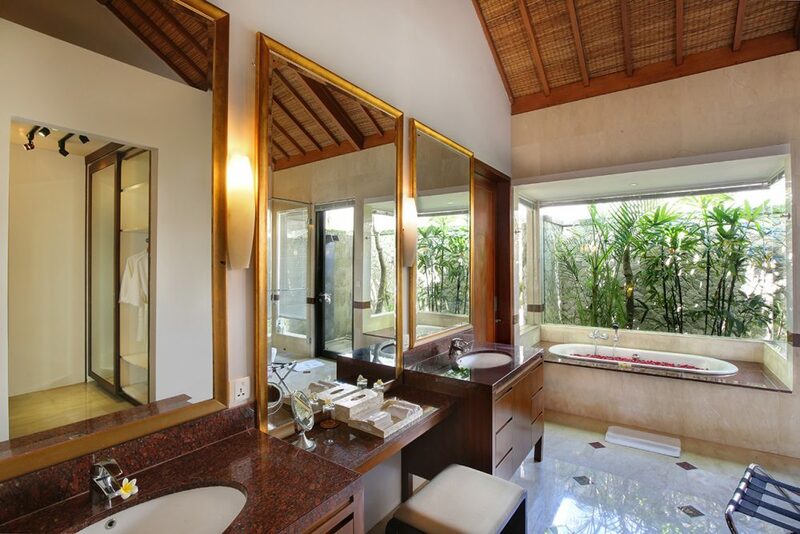 A truly regal space, this comprises a king size bed, sumptuous couches and a vast ensuite with a bath, indoor and outdoor showers, double vanity units and a separate WC. 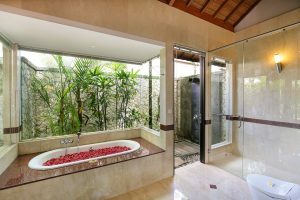 The 1st Bedroom can be configured as either a twin or king-size room and has its own ensuite with both indoor and outdoor showers. 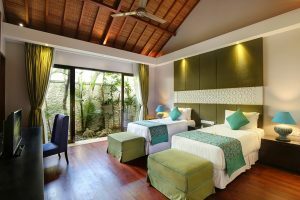 The 2nd Bedroom comprises of a king-size size bed and has a charming terrace with ocean views that peek through the foliage. 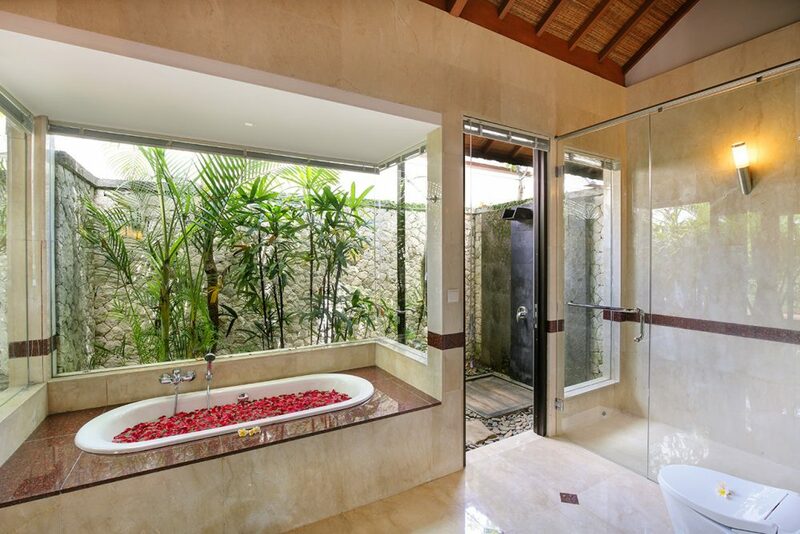 The vast ensuite has a bath and an indoor and outdoor shower. 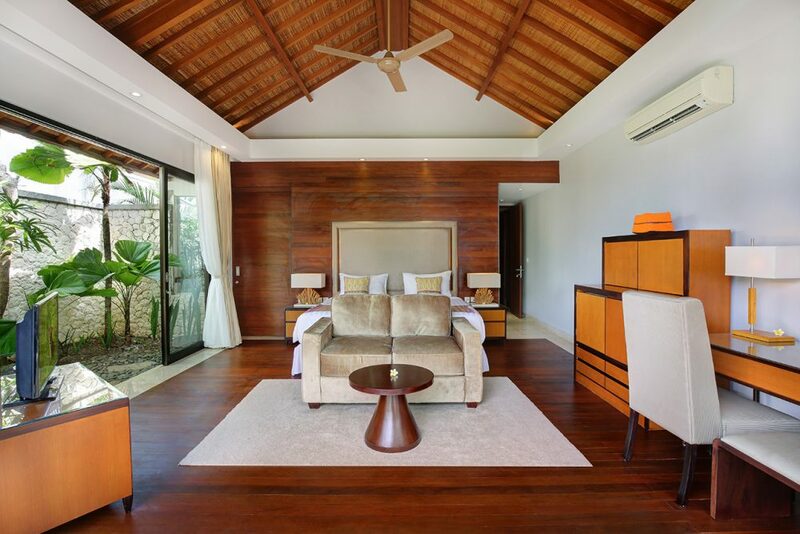 The 3rd bedroom is equipped with a king-size bed with high thread count linens and a large ensuite with a double vanity unit and indoor and outdoor showers. On the ground floor are a 4th & 5th bedrooms each with private ensuites which can be configured as either king-size or twin. 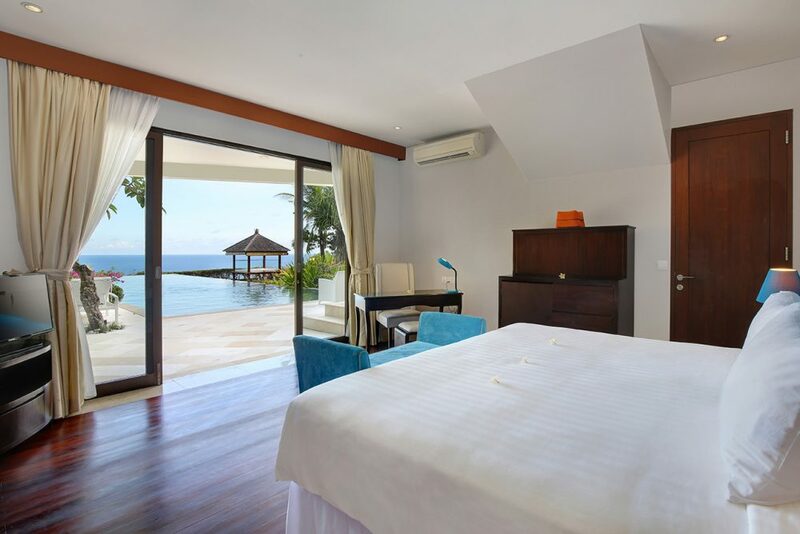 These are slightly smaller than the suites upstairs but what they lack in size they make up for in astounding views over the pellucid ocean and swimming pool. 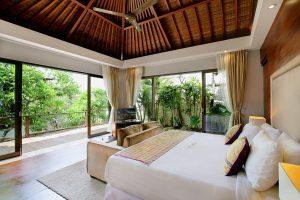 In the morning pull the curtains to embrace the heart-stopping view and welcome another day of peace and tranquillity. 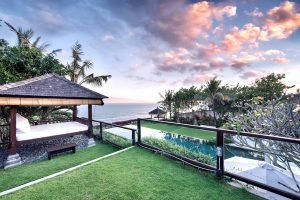 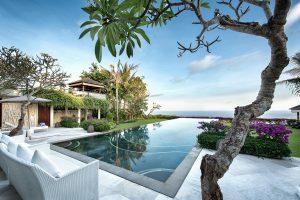 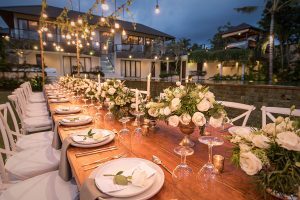 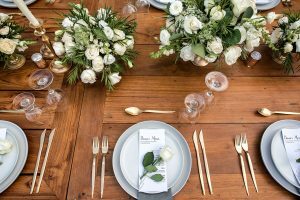 This luxurious villa comes with a team of friendly and accommodating staff including a butler during the day, a villa manager, a chef, a cook and daily housekeeping. 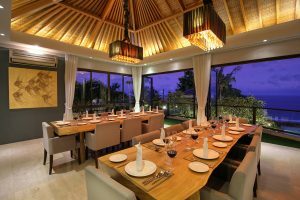 Breakfast is included as part of the package and a separately priced lunch and dinner menu with tasty Asian and Western dishes is available. Plus our talented chef is also willing to teach you some local dishes and is prepared to try his hand at anything you fancy that is not on the menu. A grocery shopping service is provided and incurs a 25% charge.